IBUKU is a team of young designers, architects and engineers exploring groundbreaking ways of using bamboo to build homes, hotels, schools, and event spaces in bali, indonesia. we are creating a new design vocabulary based on this one material and exploring the way sustainable architecture and design can redefine luxury. the materials we use, the people we work with, and the land we build on all inform our design process. 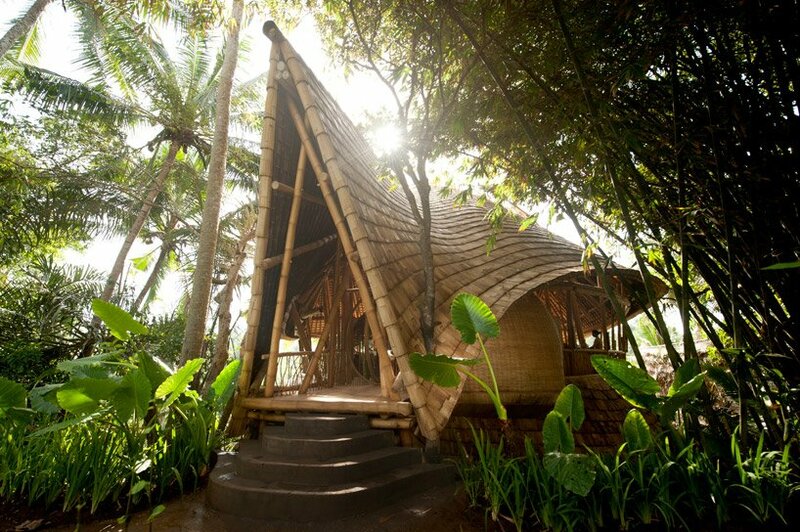 the traditional skills of balinese craftsmen, combined with our design ideas and modern engineering enable us to create original bamboo structures that meet the needs of a diverse clientele. each residence has its own unique character, as the architects work hand-in-hand with the client to tailor the design to their specific needs, with a percentage of the proceeds going to the green school. to date, 15% of the local student body is able to study on a full scholarship, as a percentage of money made from each house is donated to the school. the dwellings are typically based around radially located clusters of thick bamboo columns, like tendrils that weave into the floor beams and eventually attach to the bamboo tile or thatch canopy. it is then treated in different methods to perform various tasks within the home. larger stocks are cut into longitudinal sections to make a ladder-like frame that can be used as a semi-opaque wall component or furniture structure. thin strips are woven to make a solid but light-weight partition. bent members create an original circular opening with a swiveling door. the readily available, malleable material property of bamboo makes it possible to create free-flowing sweeping forms that maintain their structural capacity and can be easily integrated into natural stone foundations. Incredibly beautiful design.Thank you for sharing. this is indonesia, not thailand. I think this is in Bali not Thailand. Elegant. I love these local bamboo projects. Did you mean Bali, Indonesia? Beautiful, however, as Marisimas has pointed out, this would appear to be in Indonesia, not Thailand. Here’s the link to the project . . . It looks aesthetics but did they treated all the bamboo poles besides the flooring for longer usage? Definitely if the cost of building it is cheaper, then it can be commercialised out. I love it, but how do you deal with mosquitos? This is located at Bali Indonesia, at Mambal village… Not Thailand. Fantastic job Ibu well done!!! Could you connect with me…….Im in West Java near the beach on a hill wanting to do similar style but the workers here don’t attain this standard………I guess cotton or hemp mozzie nets with fans would do the trick……..good in earthquake regions such as mine………..upcoming area in West Java………….want to keep it eco-friendly as possible using solely local materials……………terima kasih. Lovely! I would gladly live in this house and retire here. Home sweet home! Thanks for sharing!